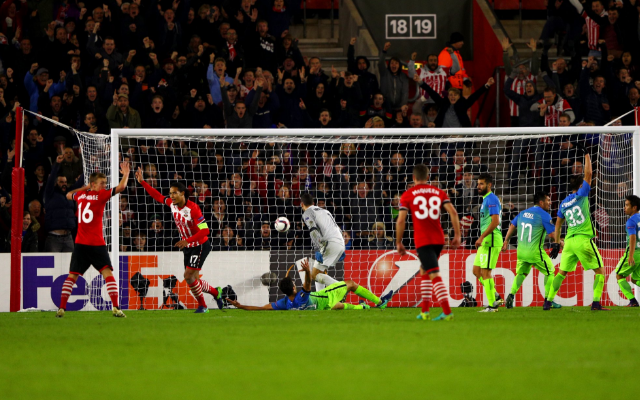 Southampton have taken a step towards the knockout stages of the Europa League after coming from behind to beat Inter Milan by two goals to one. Mauro Icardi drew first blood for the visitors, he fired past Fraser Forster on the half-turn to put Southampton’s Europa League status in jeopardy. The Saints had a tough time beating Inter goalkeeper Samir Handanovic, who saved a penalty from Dusan Tadic. They did eventually draw level through Virgil Van Dijk, who reacted quickest to capitalise on a loose ball. The comeback was completed for Claude Puel’s side after a freak own goal from Yuto Nagatomo. He won’t want to see this one again in a hurry. Southampton finish the evening in second place in group K with a three-point cushion over tonight’s challengers Inter. Six years ago to the day they beat Dagenham and Redbridge, tonight they took a huge step towards progressing in the Europa League.